The devastating effect of brain injury for hundreds of thousands of Veterans and their families cannot be underestimated. While SFTT will focus primarily on “new” therapy programs, we will occasionally report on the very unsettling problems faced by Veterans and their families as they seek to recover their lives. Some “alternative” therapies have already proven to be quite successful, but many others are not widely known to Veterans or the medical profession at large. Even if these programs were endorsed or approved by the VA, treatment is often beyond the financial means of most Veterans. While SFTT will let the “news” speak for itself, the science of treating brain injury is still in its infancy. SFTT attempts to provide balanced reporting of the pros and cons of these emerging therapy programs but strongly encourages the reader to make up their own mind as to their efficacy. A recent article in the New York Times entitled, “Hits to the Head May Result in Immediate Brain Damage,” is troubling for families raising children where contact sports is often a way of life. While the nature of brain injuries suffered by Veterans leading to PTSD and TBI are far different, the New York Times article suggests that there is still much to be learned in treating concussive events. 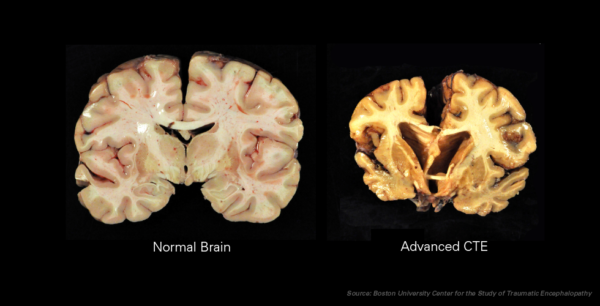 SFTT has reported on several occasions that the NFL has been investigating a brain condition called chronic traumatic encephalopathy (“CTE”) which appears to be caused by repeated blows to the head causing a protein called tau to spread and kill brain cells. For many years the NFL and the VA has tried to hide the effects of debilitating brain injuries from players and Veterans, but the evidence is now overwhelming that concussive events may cause irreparable damage to sensitive brain tissue and cells. Shouldn’t this be a warning message to all parents? Promising “new” drugs materialize daily that claim to help Veterans cope with the symptoms of PTSD and TBI. Ketamine, approved by the FDA many years ago for sedating people (but not approved for treating traumatic events) has become a popular treatment option for Veterans that have exhausted VA remedies. SFTT Commentary: As in all mind or sensory altering drugs, there are risks that are not fully understood by the medical profession. SFTT continues to support noninvasive therapies, particularly over unregulated and untested drug options. “The U.S. Army Research Laboratory and Helius Medical Technologies, Inc., from Newton, Penn., have partnered to expand on early research that could mean new interventions for improving Soldier readiness and resilience, as well as reducing symptoms of post-traumatic stress disorder, or PTSD. “As part of a cooperative research and development agreement, or CRADA, ARL and Helius are launching a research program to investigate Helius’ Portable Neuromodulation Stimulator for the enhancing cognitive and psychological readiness and response through mindfulness meditation training. Helius is focused on neurological wellness. SFTT Commentary: While this joint research program seems promising, the Army Research Laboratory has often placed troop “readiness” ahead of troop safety. SFTT hopes that this study will prove different. SFTT readers are encouraged to drop us a line if they discover an interesting new therapy to treat PTSD or TBI or would like to share a public interest story. SFTT can be reached at info@sftt.org.